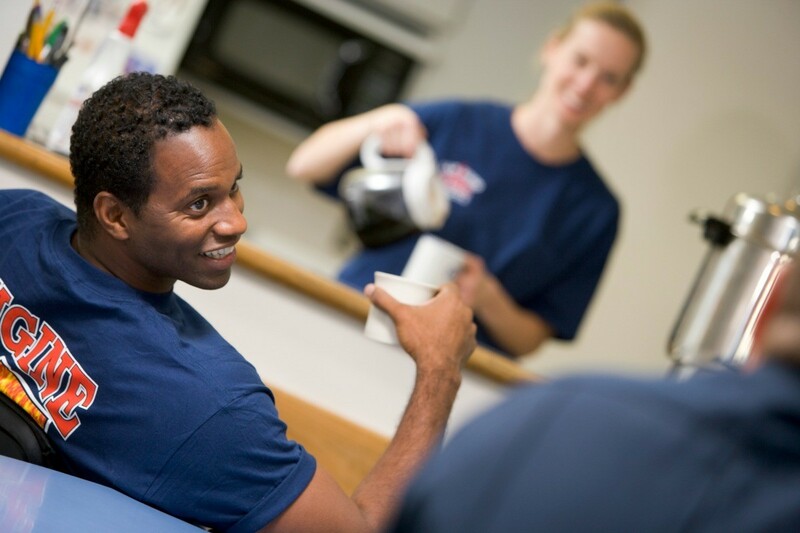 The firehouse kitchen is often the gathering place for these brave men and women between emergencies. This is a guide about recipes for firefighters. My friend, Sunny, sent me a link for several recipes collected from assorted Fire Departments and I just have to share the four I found tinged with fun humor with my fellow ThriftyFun Family Members. There is a link for all of the recipes below. Brown the meat in a skillet and add the beans with the juice and the garlic. Simmer for 15 minutes. Mash some of the beans to thicken. Salt and pepper to taste. Serve with hot garlic bread and a salad. Serving: Multiply this times the number to be served. 12 large jalapenos or how ever many you want to make. Cut the tip or small end off of the jalapenos leaving the stem on the other end. Hollow the jalapenos (we use a potato peeler). Fill jalapenos with cream cheese. Wrap jalapenos with bacon holding bacon in place with toothpicks. Broil in oven until bacon is to your liking. Remove, let cool, and eat. Peel and boil the taters, just like you were making mashed taters. When they have reached the desired softness, drain the water, mix in the sour cream, cream cheese, and 1/4 to 1/2 the stick of butter, along with some salt and pepper. Mash or whip the mixture. Place the mixture in a 9 x 13 pan, cover with foil, and bake in the oven for 45 minutes. Take out the taters after 45 minutes, and rub the rest of the butter over the top, spreading it evenly until it melts. Add some Lawry's and paprika for a little color, and then place back in the oven, uncovered, for another 15 minutes or so. Careful - they're piping hot! This is pretty simple, but in a house full of German Catholics we have it quite often for lunch. Heat the mets and sauerkraut on top of the stove; mets in a skillet, sauerkraut in a saucepan. Once the mets and sauerkraut are hot, put a met on a bun, squirt in some thousand island, put on a lot of sauerkraut, lay a half slice of Swiss on top. Put all assembled kraut/mets on a baking sheet and place in oven at 350 degrees F for ten to fifteen minutes to melt the cheese and toast the buns. If you're the cook, eat any left-over kraut while your waiting. Serve with a big pot of bean soup and some chips, then listen for the happy noise in the dormitory tonight! Thank you Deeli. These all look to be "originals" and I'm always amazed at what our firefighters who must cook for themselves come up with. We have a firefighter friend as well, and I'll be sharing these recipes with him. Since we now have female firefigters as well as males, I'm hoping that their future recipes won't be cause for heart-attacks and strokes the way some from the past were. Those fellas would eat just about anything. God Bless them all. Yes, what are "mets" ? Sorry, I thought 'mets' was self explanatory. They're hot dogs and my choice would be the spicy German type rather than the bologna type for this recipe because of the sauerkraut. Hope you got a giggle out of the final sentence in his directions.